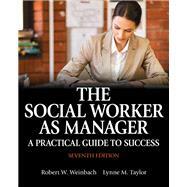 by Weinbach, Robert W.; Taylor, Lynne M.
A reader-friendly, comprehensive discussion of social work management. This title is also available as a more affordable e-book. The Social Worker as Manager: A Practical Guide to Success provides an understanding of the functions and responsibilities of managers at any level - from supervisor to executive director. The seventh edition emphasizes how management is an integral part of social work practice and critical to the success of human service programs and services. This title is written for both students and social work practitioners. It describes those management activities that social workers in the public, private and non-profit sectors encounter and how they are shaped by the uniqueness of human service organizations. This edition is easy to read, conversational, and contains many new and revised examples, topics, and practical suggestions based on the experiences of the authors. Instructors, visit pearsonhighered.com/etextbooks to register for your digital examination copy, or contact your Pearson Representative to learn more. Lynn M. Taylor is an Accreditation Specialist with the Council on Social Work Education. She worked in direct practice in the areas of child protection and medical social work for many years, and has held high level administrative positions in several human service organizations. She also taught at the University of South Carolina, College of Social Work, in both the USA and South Korea. She was an Assistant Professor at the school of social work, Radford University for five years, where she taught both undergraduate and graduate courses. She is a co-author of Applying Research Knowledge/A workbook for Social Work Students, 3rd edition (Pearson). She holds MSW and Ph.D. degrees from the University of South Carolina, College of Social Work. Chapter 2. What Makes Human Services Management Different? How Much Organizing Is Optimal? Is a Management Career Right for You?